Home/People and Sound/Navigation/How is sound used to find objects on the ocean bottom? Sonar is used to find objects on the bottom of the ocean. 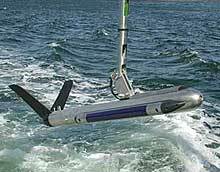 Side scan sonar is one method used to look at the detail of the ocean floor. Side scan sonar instruments are towed behind ships and often called towfish or tow vehicles (shown below). Pulsed signals are transmitted from each side of the tow vehicle and reflected back from the bottom and objects on the seafloor. The sonar signal is concentrated in narrow beams on both sides of the tow vehicle (See the diagram below). Some of the sound sent out by the side scan sonar reflects off the seafloor and returns to the tow vehicle. The tow vehicle has sensitive hydrophones (also called receivers) which receive the returning sound. The signals from the hydrophone are sent to the ship for processing and an image is made showing the strength of the returned sound over the area the tow vehicle was sending the sound. The signal is often sent to a graphic recorder which makes an image. The darker parts or the image represent greater echo strength. The image below shows a typical side scan sonar trace. The middle of the image is the path of the tow vehicle. There is a black line (or two black lines) right in the middle of the image. This is actually the sound pulse sent out from the instrument which is immediately heard by the hydrophone on the instrument. The blank white space, moving out from the black lines, is the time it takes the sound to travel through the water. The first echo from the seafloor (or sometimes from the sea surface) is the next mark. Then echos from the seafloor and objects at greater and greater distances from the tow vehicle. The patterns on the seafloor in this image are iceberg scour marks in the Beaufort Sea. Photo courtesy of Klein Associates, www.kleinsonar.com. Side scan sonar is very sensitive and can measure features on the ocean bottom smaller than 1 centimeter (less than 1/2 an inch). Typical uses of side scan sonar include: looking for objects on the seafloor (sunken ships, pipelines, downed aircraft, lost cargo), detailed mapping of the seafloor, investigation of seafloor properties (grain size, etc) and looking at special features on the seafloor like underwater volcanos. When the sound sent by a sonar reaches the seafloor several things can happen to that sound. Some of the sound may be absorbed by the seafloor. Some of the sound is almost always reflected . There are several different ways the sound can reflect. The sound can be directly back or it can be scattered in many different directions (see the diagram below). Sound that is scattered back toward the tow vehicle is called backscatter. How much scattering, backscattering and absorption happens depends on the properties of the seafloor. Hard materials, like rocks, will scatter more sound while soft materials, like mud, will absorb more sound. Different amounts of scattering produces different amounts of sound returning to the tow vehicle and a different image of the seafloor. The images below show some examples of how one property of the sea floor (grain size) affects the side scan sonar image. Images by David C. Twichell (USGS), from: Twichell, D.C., Cross, V., and Parolski, K.F., 2000, U.S. Geological Survey Open-File Report 00-167, 26 pp. 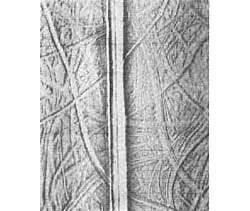 The image above shows a side scan sonar image on the left. On the right are two samples taken from areas in the side scan sonar image. 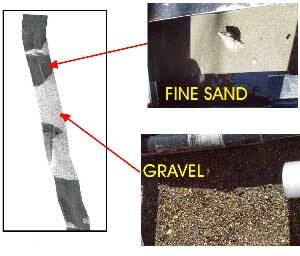 The fine sand is darker in the image because more energy is reflected back from the uniform grain size. The gravel is lighter in th image because the gravel scatters more of the sound and less reflects back to the side scan instrument. 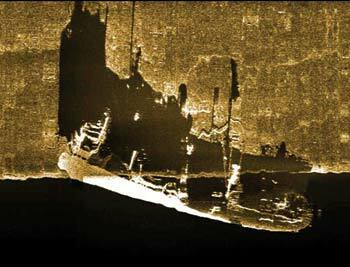 Side scan sonar is often used to find objects like shipwrecks on the seafloor. The image below is of the Empire Knight, a British cargo vessel, that sank off Boon Island, Me in 1944. The ship is located in the bottom part of the image. The shadow of the ship can be seen in the upper part of the image. The shipwreck of the Empire Knight. Photo courtesy of Klein Associates, www.kleinsonar.com. Features on the seafloor create shadows in the side scan sonar images because of the geometry of the sound source and the object. The drawing below illustrates how a shadow forms. Illustration of how a shadow forms with side scan sonar. Copyright URI. The side scan sonar sends out the sound. The sound will reflect off the object back to the instrument. But the object also “shades” part of the seafloor from the sound. No sound will reach the seafloor behind the object. This will produce a shadow on the side scan sonar image. The shadow will be white. The shadow is black in the image of the ship above because the color has been reversed to highlight the ship.